On view for one-night only, the Annual Group Invitational is only the second group exhibition in the gallery’s four year history and is sure to become a highly-anticipated tradition. The exhibit features works in a broad range of mediums by forty-six highly-revered, emerging and established contemporary talents. From photography to sculpture, mixed media to metal-working, and everything in between, these works are bound to stimulate and expand your senses like no other. Supported by a live DJ set by Cleveland’s own Brian Brain of (216) Bass, this is one exhibition not to be missed! Be sure to join us for the Annual Group Invitational After-Party, hosted at Lava Lounge, immediately following the gallery reception on January 7. A swank atmosphere with live DJ, sumptuous foods and artfully-crafted drinks welcome gallery show-goers. An exhibition of new artworks from the portfolio, Limbs & Ladders by Cleveland-based talent Katie Maurer will be on view in the downstairs lounge. Lava Lounge is located at 1307 Auburn Avenue, in the historic Tremont neighborhood of Cleveland. 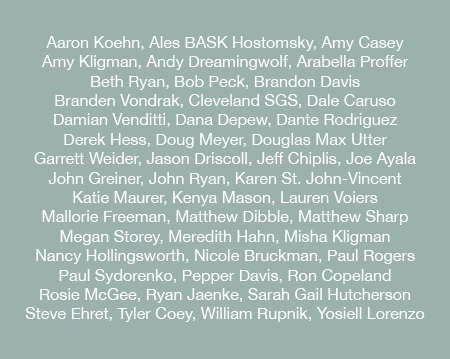 Reception at the Euclid Avenue gallery 7-10 PM, Saturday, January 7. After-party at Lava Lounge 10 PM – ? AM. This entry was posted in Art News, arts, cleveland, exhibits, galleries, ohio, shows and tagged art, art news, cleveland, exhibit, exhibition, gallery, ohio, show, William Rupnik. Bookmark the permalink.